The best things happen when you don’t plan them. It was Friday night, and I realized I had no plans for the entire weekend. I remembered the Grizzlies were playing the 76ers in Philadelphia Saturday night. It’s only a two-hour drive, so I got online and bought a ticket. You only live once right? I left my house at 4pm and was parked at the Wells Fargo Center just before 6pm. I enjoyed a Philly Chicken Cheesesteak in the Arena Club while waiting for the doors to open at 6:30. Then I immediately made my way to my seat, which was pretty much where I was in DC just a week and a half before. But the Wells Fargo Center must be smaller than the Verizon Center because I was right next to the tunnel and closer to the bench. My favorite James Johnson came out and said Hi, then Z-Bo (aka Zach Randolph) came out and said Hi. 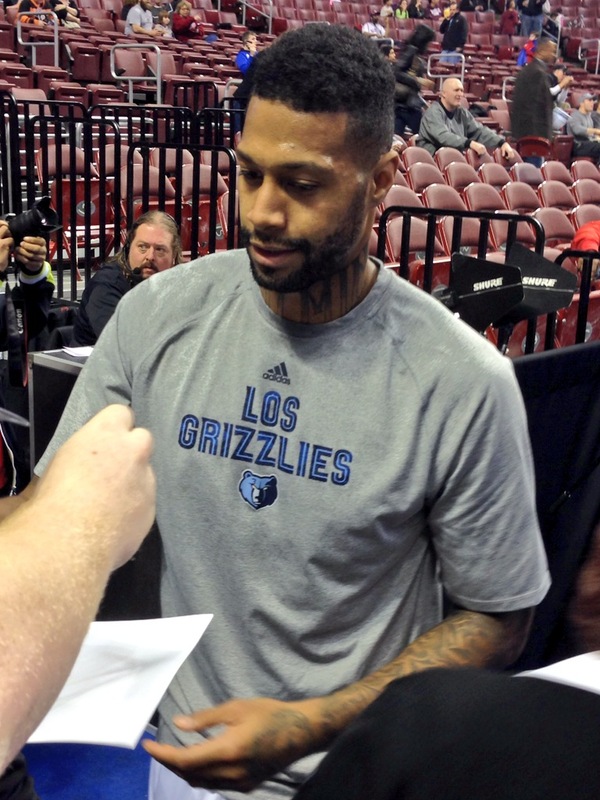 James Johnson was signing autographs and I told him to make sure that was a Grizzlies hat he was signing – and he smiled at me. sigh! The first half of the game was terrible! The Grizzlies were playing down to the 76ers level. The Sixers have only won 15 games all season, and had just lost 19 in a row. At halftime, the Grizzlies were only up 45-36 and shooting 50%. Both ZBo and Gasol were visibly aggravated with their performance. The second half was much better. The Grizzlies came out like a whole new team. James Johnson finally made it in toward the end of the game and had a fantastic dunk! I love being that close to the bench. At one time out, Mike Conley was just jammin out to the song. With about six minutes left, we were up by 30 so I decided to leave. I was home by 11:30 – I made great time! The final score was Grizzlies 103 and Sixers 77. Mike Conley led the Grizzlies with 19 points, 4 rebounds and 4 assists. Z-Bo added 14 points. The Grizzlies are on their way to the playoffs, hopefully. With any any luck, the Grizzlies will again have a home playoff game while I’m in Memphis in May. By the way if the Grizzlies were in the Eastern Conference, they would be in third place – a definite for the playoffs. Hopefully, we will continue to win and finish out the season strong!